Nana nana nana nana BATMAN! Jeez, I love Batman. Luckily for me, as an action figure collector and Batman aficionado, there ain't no shortage of Batfigures in today's Batworld. 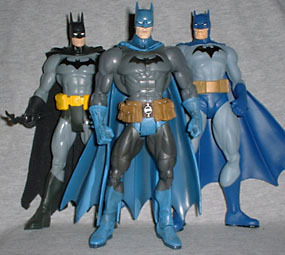 In fact, Batman is probably up there in terms of most representations in action figure form. Think about it: he's had figures made of him for decades, and any time a Batman line gets produced by a mass market company, we get tons of neon day-glo Batman variations. Which brings me to Mattel, famous for killing its revamped He-Man line and the more recent comic Batman line by shortpacking villains and flooding the shelves with redundant variations of the hero. Because, as we all know, every kid who buys toys wants a hundred different versions of the same guy, and doesn't really care at all if he has anyone for that guy to actually fight. I know when I was a kid I would just gather all my neon Batmen together and they'd all have a grand discussion on how they had successfully rid Gotham City of all villains...wait, what?! No, when I was a kid, I was actually more attracted to villains than heroes. I also know I wanted to get every figure in the lines I liked, because I was constantly reminded in commercials and on action figure packaging that I should "Collect 'Em All!" But Mattel, apparently, was too busy rolling in Barbie revenue to care about its male-centered lines. At least, until now. Is it true? Could it be? Mattel has seen the error of its ways and is giving fans a toy line with varied characters that aren't all one-per-case? They've finally stopped releasing ridiculous variants of their main hero? Well, yeah, kind of, with the DC Superheroes line. Focusing on characters from the realm of Batman and Superman, Mattel has so far held back from releasing endless versions of the two main heroes, instead giving us a nice supporting cast. However, each wave is bound to have at least one of our heroes, and the third wave gives us the second Batman in the series. While the first wave gave us a new version of the well-received Zipline Batman with a new paint scheme, added articulation and a plastic cape, the third-wave Bats is an all-new sculpt, albeit by the same sculptors: those kooky Four Horsemen. While it still represents Batman in his standard uniform, it's an entirely different interpretation. 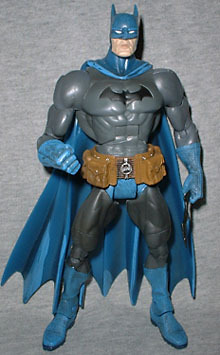 This Batman is almost Frank Miller-esque, with its stocky proportions, bulky utility belt, and shortened "bat ears". 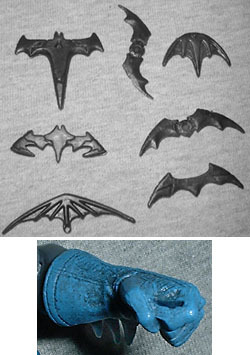 The Horsemen also added some realism that is not often seen in Batman's costume, giving the boots and gloves a weathered, leathery appearance complete with visible stitching, and allowing the costume to fold and bunch up in places where that might realistically happen, such as the inner elbows and torso. The cape is plastic, which always works better than cloth when it comes to Batman. Some parts of the body, particularly the crotch and upper leg areas, appear to be retooled from the wave 2 Superman sculpt, but it's not really noticeable. All in all this is a great sculpt. And hey, it's got a great paint job to match! Mattel is getting better at their use of paint washes, though it's bound to vary from figure to figure. The cowl is a bit over-done, but the rest of the figure is very nice. The skintone on the face looks great, and the belt is a nice muted yellow ochre with silver accents. The suit seems to utilize some air-brushing to bring out the detail, and it's nice and subtle. The blue boots, gloves and underpants have a black wash for the stitching and wrinkles, and it all looks good. The cape uses the same air-brush style as the suit, rather than the horrible wash of the Series 1 Batman. The articulation is enough to make any Bat-fan swoon. Articulation has always been scarce on Batman figures, given that up until recently license holders Mattel and DC Direct were not particularly known for packing their figures with Marvel Legends-like joints. While DCD still seems comfortable with not even providing a waist on most of its figures, Mattel has learned how to combine a great sculpt with some nice movement, and this figure is a shining example: balljointed beck, balljointed shoulders, peg biceps, hinged elbows, peg glove-tops, hinged torso, peg waist, pegged and hinged hips (they act like balljoints without the ugly ball), peg mid-thighs, hinged knees, and hinged and pivoting ankles. Quite a departure from Zipline Batman's 10 points of articulation. That guy didn't even get elbows. In addition to withholding a waist joint on most of its figures, DCD is also known for not always giving its Batman figures a batarang. Batman needs a batarang. It's a fact. Mattel knows this, and they knows it good. They know it so much that they gave this Batman seven frickin' batarangs. Batarangs of all shapes and sizes. Unfortunately, I was only able to get him to hold four of them, since both his hands are sculpted into fists and the only place to squeeze an accessory is the small divit in his left hand. 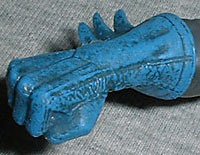 Still, seven batarangs! You can't be mad at 'em. So...great sculpt, nice paint, great articulation, and seven batarangs! Long has the battle raged over which Batman figure was superior to the rest. "Hush" Batman and Zipline Batman were the popular front runners, but they both had their significant flaws, and neither of them even comes close to this guy when it comes to articulation. Or accessories, for that matter. As far as I'm concerned, the battle is over. This is the only Batman that has it all. Mattel has schooled DC Direct. What do all of those Batarangs do? Tell us on our message board, the Loafing Lounge.